Dave and I spent the holiday from wednesday evening until yesterday (sunday) at Hilton Head Island! I love Hilton Head and all the other islands down the SC coast all the way down Georgia. I love how the moss hangs off the old craggy oak trees...it is SO "SOUTHERN". The weater was warm, low 70's....and I should have packed shorts! We avoided all post-thanksgiving shopping. Hilton Head doesn't have that much anyway, it's off season. We did end up at Sam's club and bought a few things, but it was more what we needed, not in the way of gifts. Quipped by Bonnie K. Hunter at 7:49 AM 17 Snips & Comments by others! I got a voice mail from Tonya's hubby, Tom this morning! I was at the chiropractor's office and had my phone off, so didn't find the message until I checked my phone later. He said that Tonya has come through the surgery just fine, and though her throat and voice are a bit rough and scratchy, she is in good hands! I'm finishing up loose ends here and getting ready to head out to Hilton Head. It's been raining non-stop for 2 days! MISERABLE weather.....so it's good that I've got a couple handwork projects packed to go. I decided not to take the sewing machine, but rather use the time to relax and either crochet on the afghan or do some hand quilting....Good weekend for rented movies and staying in I think. Quipped by Bonnie K. Hunter at 2:41 PM 12 Snips & Comments by others! Jason is happily working at Olive Garden and things are going well. Jeff is back working at Mc D's after a misunderstanding had him quit/fired. (These places don't work very hard to keep young kids, they are so disposable!) So all is calm and very busy with employment in SC! Jeff also passed the written part of his driver's exam to get his permit. He won't get his license yet, but we figure we can use the chance to drive as some sort of incentive to help with more attention to grades, etc. I don't know if it will work or not, but it's worth a try? A month or so ago, before Jason was coming home, and before both were employed, Dave found a condo deal for thanksgiving weekend at Hilton Head. Now both boys have jobs and can't get off for the weekend...and the condo deal was non-refundable! Have you ever HEARD of parents taking off, leaving their kids home to fend for themselves on THANKSGIVING?! Well, that is what is going to happen here. I figure I can cook a turkey any other day of the week (trying to find one when they are both home to enjoy it) and DH and I are going to Hilton Head by ourselves. That ought to keep me well away from the worst shopping weekend of the entire year....and I'm not sad to miss it! Quipped by Bonnie K. Hunter at 8:02 AM 8 Snips & Comments by others! I mentioned a while back that I will be attending a retreat in Feb....as the resident massage therapist! I just got an email from the gals running the thing, and they have put up the beginnings of a website. I wanted to post a link for Just Stitchin Retreats so that any of you south east gals can pass the info on to your guilds if you are interested in getting retreats together! The retreat I'm doing is a "Quilt Camp" style retreat where you work on your own projects. 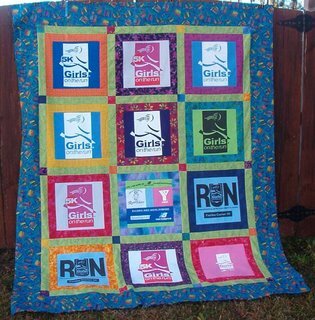 A mystery quilt and some other fun stuff will also be offered if you want to participate in that. The Palm Key retreats are where they bring in known teachers to teach special weekend workshops. Quipped by Bonnie K. Hunter at 7:06 AM 3 Snips & Comments by others! 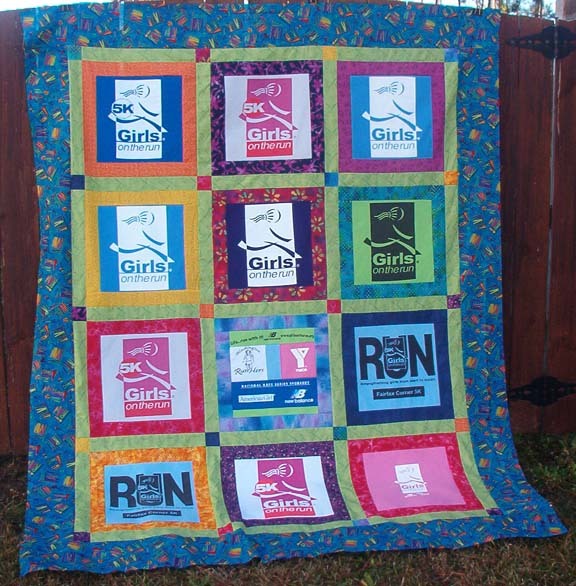 I have a friend who wants to give her daughter a Tshirt quilt made from her "Girls on the run" shirts...for CHRISTMAS! She asked me to help her just the other day and my mind was trying to figure out HOW in the world we can get this done before Christmas with all else that I have going on here. I told her to pick up the interfacing for stabilizing the shirt logos, and we would raid my stash for the fabrics to go with it. 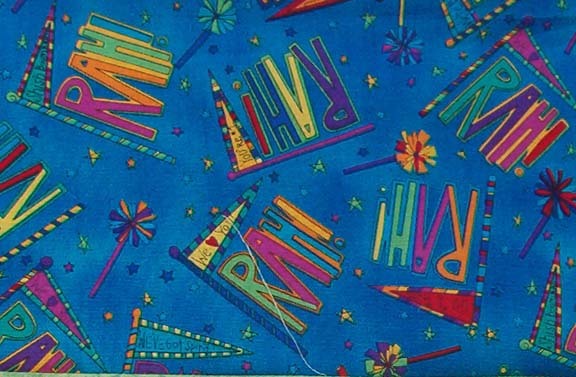 I had the perfect fabric (thanks to Finn!) for pulling it all together in the border...all the colors of the window framing we used come from the colors in the border, and the words RAH!! will continue to cheer her daughter on as she continues to run. 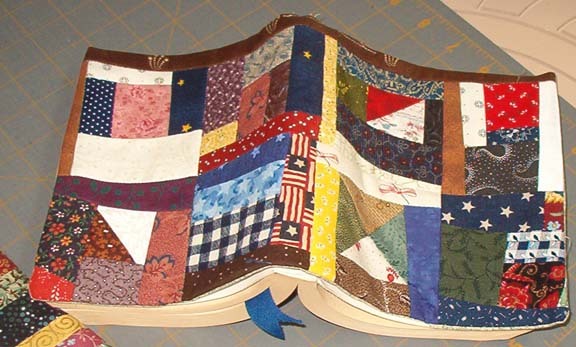 It was fun having her here yesterday....she fused, I cut, we sewed...and by 9pm last night the top was done. 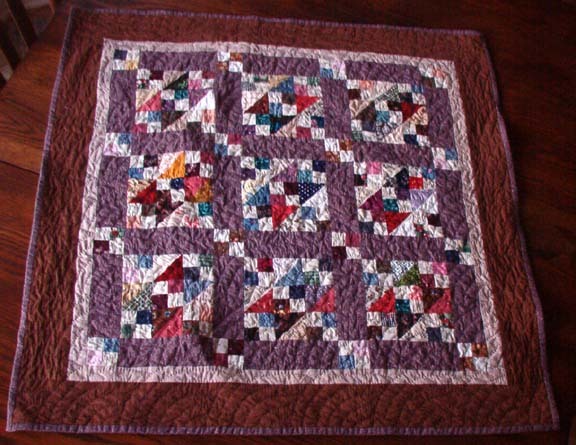 It was an easy quilt to make. The tshirt blocks were cut 12.5"..the frames and sashings are 2.5" cut strips....the cornerstones are 2.5" squares from the ends of the framing strips....I busted stash and we had fun! Quipped by Bonnie K. Hunter at 9:12 AM 15 Snips & Comments by others! Today I wanted to do something quick and fun! So...I dug in my "pieces-parts"...little string pieced trimmings, etc. 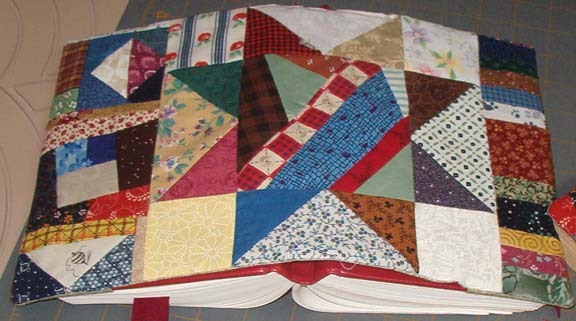 And there were a few blocks I had crumb pieced..left from a little crumb quilt top that I had made. The blocks were 3.5". Very cute size for using up little stuff. I also found they are a good size to have stashed back for coming up with a quick project! How many of you have books you love...be it a cook book, a favorite novel, a quilt book, a hymn book...an anything book? Make a cover for it using your leftovers! 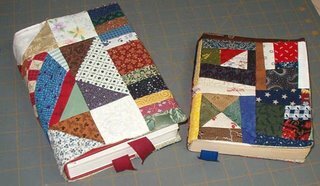 Some may think this is corny, and too "martha stewart" ish....but I had a couple beat up books I wanted to make covers for. One was a small paperback with inspirational thoughts for the day, 365 days a year...and I really like it. 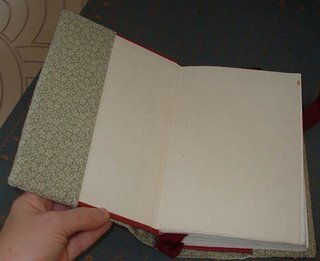 It was worn and dirty and looking pretty bad though, so this was a good candidate...and another book became the second guinea pig. I had fun doing these, they were easy...and FAST! 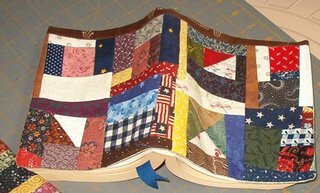 I added ribbon book marks sewn into the seam at the center.....I didn't even bother to quilt them! Music has always been such an important part of my life and I can really feel the holiday spirit (especially through the Christmas season) when I am singing in a choir. When we lived in Idaho I sang with the Boise Master Chorale. And went to NYC and sang Brahm's Requiem in Carnegie hall. I loved singing with the Boise philharmonic orchestra and the Manhattan Philharmonic orchestra. I also sang with the Treasure Valley Chorale in Eastern Oregon, and the Twin Falls Chorale when we lived in Burley. Since moving to TX, and then to SC....I stopped singing. Life took over. But I missed it. I love the traditional classic music, like Handel's Messiah. I could get lost in that music. I know a lot of people don't like it, but I do. Last week I auditioned for the Cathedral Chorale in Columbia, and I made it! Tonight is my first rehearsal, and we are working on a Requiem by Maurice Durufle...all in latin. It is SO beautiful. It feels good to have a place to sing again. Since we left Idaho, I turned that side of my soul off because there was not a place for me to really sing. Jason is doing well here, and it is wonderful to have him HOME. He has doing some checking for jobs. He was working at Olive Garden in Mankato,MN and has been to the Olive Garden here to talk to them about transferring. They want him! He just needs a couple of phone calls to take place between the two places for references...and hopefully he will have a job in the next day or so. It is great for them because he is already trained. It's been good for Jeff and Jason to spend some time together too. This past weekend was Dave's company picnic....it was at the ZOO! What a fun place to have a company picnic. We ate burgers and hotdogs and all the fixins, and got to walk around and see all the animals. We had a great time. I'm sure Jeff would NOT have come with us unless Jason was along,and since he was...we all had a very enjoyable time. Quipped by Bonnie K. Hunter at 2:13 PM 21 Snips & Comments by others!